Thanks to Jill Hanner, a fellow FitFluential gal, and Jean at Neocell, I was sent a sample of Neocell's Collagen Sport French Vanilla protein powder to try out. I enjoy trying out new things, especially tasty ones. When I first got my delivery, I was not running at all. Rather, I was spending a lot of quality time on the couch with a horrid fever during my forced rest. When I emailed Jean to let her know I received my Collagen Sport, I let her know I was laid up. She directed me to a link regarding the benefits of Collagen. The article outlines the benefits of a collagen supplement. Because I am such a visual person, I was immediately drawn to the Orange Smoothie in the photo. Immediately I needed to make one. The downside is that I did not have any oranges in the house at that point. But I did have frozen orange concentrate. Better than nothing, right? I got busy whipping together my own Orange Smoothie. I put all the ingredients in the food processor (because I haven't gotten a blender yet) and blended away. This smoothie was delicious. But the next time I make it, I'll probably add in 2 spoonfuls instead of the 1 because I do love orange. I've been making protein smoothies as part of my post-run routine and have noticed that I am not as achy after my long runs as I have been in the past. I am definitely sold on the benefits of Sport Collagen. The taste is excellent as well. In addition to smoothies, I also made some protein bars. I came across this recipe on Pinterest made by one of my fellow FitFluential gals, Jess at Blonde Ponytail. These bars are phenomenal. I actually made them to surprise the girls after their long run that I didn't go on because I was still recovering. Just because I didn't run with them didn't mean I was going to skip out on girl time entirely. The bars were a hit! 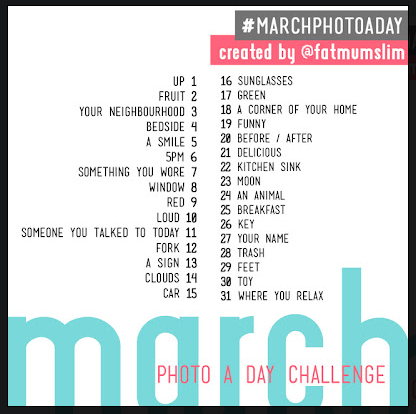 I am also going to join Jenn and Carrie (another FitFluential gal) in the March photo challenge put together by @fatmumslim. Here's my UP photo - taken just after riding around on the snowmobile with the kids. Do you use protein powder in your training/recovery? Any favorite recipes to share? I do use protein powder in my training recovery. I have upped my protein intake considerably over the past week to get rid of sugar cravings and it has worked beautifully. I like to mix a scoop of protein powder into oatmeal for breakfast, and I also use it to make smoothies after we run. Also making protein pancakes with powder and power balls! Those bars are some of the most delicious things I've ever had! Love your photo, good luck with the challenge! I shared the March one with my mom since she is doing the photo a day thing this year!